Citizenship Washington Focus is an educational conference for youth ages 15 to 19. 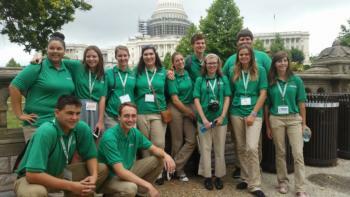 Hosted at the National 4-H Center near Washington, D.C, it gives youth the opportunity to explore, develop, and refine the civic engagement skills they need in order to become outstanding leaders. Youth ages 15 to 19. Delegates must be at least 15 years of age by time of travel to participate. You do not have to be a current 4-H member to participate. Please contact us at ca4hwashingtonfocus@ucanr.edu if you are not a current 4-H member. $2,949 - Includes transportation (air and ground), housing and most meals, National 4-H Citizenship Washington Focus conference, plus access to the tour sites. This 11-day trip includes the Conference Only package plus 4 extra days of educational tours in Gettysburg, Philadelphia, and Baltimore. Please see the Citizenship Washington Focus event page for the full timeline of payments and required webinars to participate in this trip.